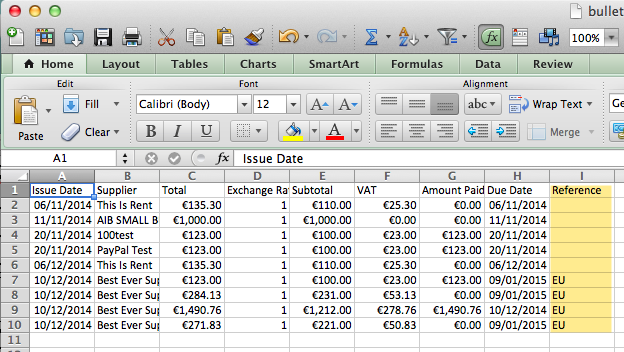 How Do You Do Non EU Purchases In Bullets Accounting Online Software? Q: How Do You Do Non EU Purchases In Bullets Accounting Online Software? How do we show purchases as EU or Non EU purchases etc on the Return of Trading Details at the end of the year. That’s simple to do, you can just enter a term like EU into the reference. Then you can search for that reference in Bullet or simply export to Excel and sort by EU. I’ve made you a animation to explain both. Hope that helps. 137Support budgeting and actual versus budget56Hi guys is the email invoice function not working/slow today169Director – Employers PRSI27Hello. I have made some company expenses which I paid from my own cards (as a director) – I have not invoiced yet. What is the best way to add them as Money Out?17Hi, I’m getting an error when I try to upload a receipt using the IOS App. It looks like it full uploads and gets to 95% but then I get this error. It was the same yesterday.